BLAST CABINET 10 HP Compressor are built to last and are SUPER quiet in operation. This is because of our low pump speeds and compressor design. The Pump has all steel connecting rods with replaceable rod bearing inserts. This means our rods can be rebuilt and are not a throw-away. 99% of our competitions (name brand) are using aluminum throw-away connecting rods with no rebuild able capability. The all cast iron crankshaft with ball bearings on the front and rear of the crankshaft create a smoother operating compressor and less drag and less electric being used. Removable 100% cast iron cylinders. This is more stable under heavy workloads and does not warp from heat like aluminum cylinders with a pressed-in sleeve. Most of our competition are using aluminum cylinders with a pressed-in sleeve. They are only good for 40-50% duty cycle and claim 100% duty cycle. In a year or so, most are replaced because they would not hold up under heavy use. All cast iron cylinder heads – NOT aluminum. Aluminum heads from heat will warp and cause head gasket problems. BLAST CABINET 10 HP Compressor Compressor are Cast iron head is more dependable and will last with trouble free operation. Intake and Exhaust valves are disk valve design. Most of our competition are using reed valves which are throw away and not rebuildable. Disk valves can be serviced in minutes instead of hours like reed valves. Our disk valves come out of the top of the head. Disk valves have been around for over 100 years. Our compression and oil rings are high quality and provide low oil carry over (1-5 pmm). Our pumps are precision ground pistons with tight tolerances for low oil carry over. We also use quality non-absorbent gaskets. This keeps oil seepage from coming off of the pump. This pump has an all cast iron flywheel with built-in fan– NOT aluminum. Aluminum does not give the proper throw when the pump is running. 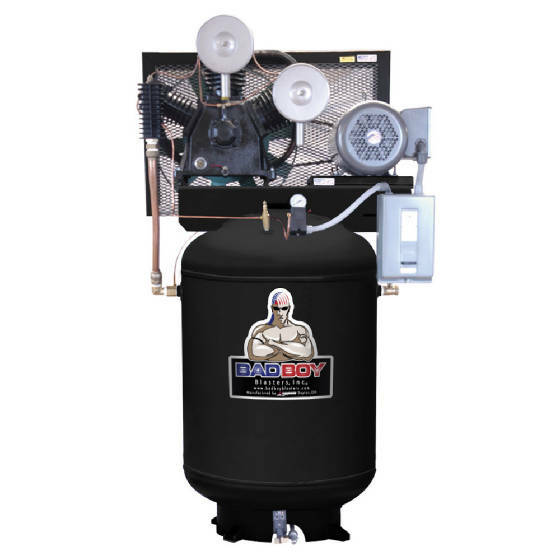 BLAST CABINET 10 HP Compressor Compressor the extra weight of cast iron when running gives the pump more throw on the compression stroke and puts less load on the electric motor. Our crankcase is also all cast iron – NOT aluminum. All cast iron will give stable crankshaft alignment and will handle more work load under heavy load conditions. This pump has built-in intake head unloaders.